County Commissioners have unanimously approved an amendment that adds to the Land Development Code an important part of the Ruskin Community Plan governing development. The 7-0 vote last week closes a loophole in county development regulations that control building in Hillsborough County. Smith was also impressed by the turnout. 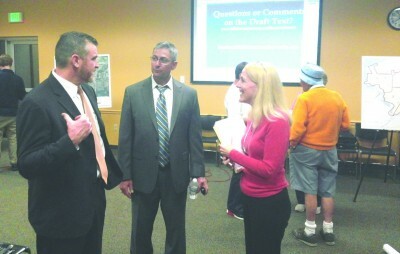 Ruskin’s Mariella Smith discusses the new Land Development Code with county attorney Adam Gormley, left, and Joe Moreda, director of the county’s planning and zoning division after a public meeting introducing the amendment March 24 at SouthShore Regional Library. Sandy Council, president of the Ruskin Community Development Foundation, 20 local residents and Kent Bailey, chairman of the Tampa Bay Sierra Club, all made the trip to downtown Tampa for the June 12 meeting and urged commissioners to back the amendment. “As the chair of the Tampa Bay Sierra Club, I would like to state for the record that the Sierra Club is very pleased to see that this matter related to the Ruskin Community Plan is being resolved with this amendment, which we very much support,” Bailey said. Adopted by the Hillsborough County Commission in 2005, the 16-page, 3,200-word Ruskin Community Plan was the product of two years of intense debate and compromise between residents, developers and county officials. The aspirational, non-specific language of the Ruskin Community Plan was incorporated into the county’s Comprehensive Plan, Hillsborough’s de facto constitution that outlines the overall goals for development. The nitty-gritty of development guidelines — how much square footage a home in certain areas can have or how tall a wall needs to be — is in the Land Development Code. Specific guidelines in the Ruskin Community Plan didn’t make it into the Land Development Code in 2005, hence the need for an amendment. The new amendment gives the Community Plan guidelines statutory muscle. The new amendment includes detailed guidelines for future development — land use, density and lot sizes among other things — in four areas of Ruskin. Area 1: The Old Ruskin neighborhood west of downtown will feature lower-density single-family housing in keeping with the traditional character of the area. Area 2: This area east of downtown and west of the I-75 employment center will accommodate a variety of housing types, including multi-family and entry-level housing. Area 3: This area south of College Avenue will accommodate a more suburban style and type of residential development with safeguards for the redevelopment of property along the Little Manatee River. Area 4: This area southeast of I-75 will retain its rural and agricultural character and provide for enhanced interaction and access to the publicly owned lands adjacent to the Little Manatee River. County Commissioner Sandra Murman, whose district includes Ruskin, credited an activist local community and county staff for resolving the issue so quickly. “I really want to thank the residents of Ruskin for caring so much about your community and the character and the guidelines that are in the plan now and will really determine the future of Ruskin,” said Murman. Swift, unanimous passage of the amendment is a testament to the community, Smith said. “Without the citizen involvement and perseverance, and not just one person, but the emails and the people turning out at public hearings, being involved from the beginning to the end … without all of that, an integral piece of our Community Plan would still be in the wastebasket and we wouldn’t even know about it,” she said.